Made by Maudslay, Sons & Field Ltd in England, 1837. This engine was made by the company established by Henry Maudslay, who is renowned for his founding role in British precision engineering. The engine reflects the skill and pride in workmanship that he instilled in his workers, several of whom became leading designers and manufacturers of machine tools. This rotative double acting six-column beam engine is capable of developing 12 horsepower (8.9 kW) at 20 rpm when supplied with steam at a pressure of 7 psi (48 kPa). 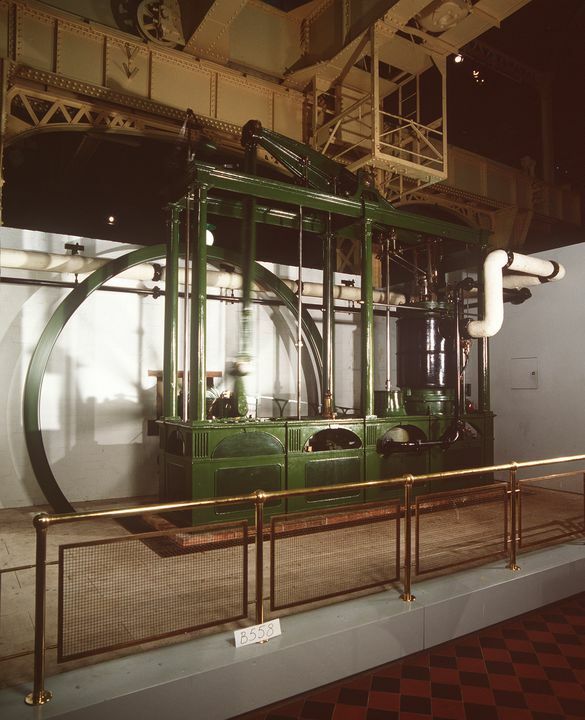 It is similar to the museum's Boulton & Watt beam engine except that it is free-standing, the cooling water tank runs the whole length of the engine, and the flywheel is turned by a crank. It features classical columns, a corniced entablature, and a panelled plinth around the tank. Most parts of the engine are painted green. The cylinder, which is cast in one piece with its steam jacket, is painted black. There are five vertical rods hanging from the overhead beam. Viewed from the front (that is, with the flywheel at the back), the rod on the far right is the piston rod. Pushed by steam acting on the piston in the cylinder below, the piston moves the beam via a Watt parallel motion mechanism, which converts the straight-line motion of the rod into the arc-wise motion of the end of the beam. The second rod (to the left of the piston rod) operates the air pump, which sits in the tank below the cylinder and which evacuates the separate condenser and delivers the condensate (water formed when the exhaust steam cools) to a small holding tank. The third and fourth rods operate pumps that return the condensate to the boiler through the black-painted pipes. The heavy cruciform rod at the left hand end of the beam is the connecting rod, which drives the output shaft and flywheel through a crank. The flywheel maintains momentum throughout the engine's stroke. It is cast in two parts, which are elegantly joined via curved scarf joints at the rim and hub. Its eight spokes are octagonal in cross section and splay smoothly to meet the hub and rim. Steam supply to, and exhaust from, the top and bottom of the cylinder is controlled by the valve gear attached to the right hand side of the cylinder. Steam is supplied cyclically above and below the piston by a sleeve valve driven, via a bell-crank lever, by a long triangular linkage connected to an eccentric on the crankshaft. A second, concentric, sleeve valve regulates the duration of steam admission and thus controls the speed of the engine. This control is achieved by the use of the Watt governor (on top of the engine at the far left-hand side) acting through two bell-crank levers and a rod running the length of the engine. The governor is driven by a belt drive from the crankshaft through a pair of bevel gears. Cylinder stroke: 30 inches (762 mm). Plaque on side with raised lettering "MAUDSLAY / SONS & FIELD / ENGINEERS / LONDON / 1837"
The engine was manufactured by Maudslay, Sons & Field of Lambeth, England in 1837. Henry Maudslay was born in Woolwich in 1771 and began work, when 12 years old, as a 'powder monkey' at the Woolwich Arsenal. In 1789 he went to work for Joseph Bramah, designing and making lock-making machinery. From this opportunity, Maudslay achieved recognition for his production, and standardisation, of screw threads. In 1797 he set up in business as a toolmaker and engineer in the centre of London. In 1810 Maudslay transferred his business to Lambeth Marsh. By 1812 the firm was known as Henry Maudslay & Co, and it became Maudslay Sons & Field in 1820. Joshua Field, who had been a draughtsman at Portsmouth Dockyard, joined the firm before that date, and three of Maudslay's sons joined it at different times. The firm built marine steam engines, and by 1900 some 658 vessels had been fitted with Maudslay engines. The firm also made time balls, including the one that was installed at Sydney Observatory in 1858. Another achievement was the training provided at Lambeth for foremost British engineers including Joseph Whitworth, James Nasmyth, Joseph Clement, William Muir and Richard Roberts. The firm went into receivership in 1899 and ceased trading in March 1900. The engine was installed at William Bradley's Mill at Bradley Grange near Goulburn in 1837 or 1838 and was used there continuously until 1921. At first it was used to drive flour millstones, the central lift in the mill, and maltings equipment. A brewery section was opened around 1840 and operated until Bradley's death in 1868. The next owners, Messrs Walford, Spark and Emanuel, used the complex solely for milling flour. The Goulburn Meat Preserving Company used the premises from February 1869 until October 1871, and it is likely that much of its machinery was driven, via line shafting, by the Maudslay engine. The site was redeveloped and reopened as a brewery in 1874 by W J Bartlett & Co, which became famous for its stout. The business was sold to Tooth & Co Ltd in 1921, after which the plant was closed down. In the sale agreement with Tooths, Mr Bartlett retained the right to dispose of the engine. Mr Bartlett donated the engine to the museum in October 1929. It is thought to be the only existing Maudslay engine of its type. For many years it shared an engine house behind the main museum building (on a site shared with Sydney Technical College) with the Boulton and Watt beam engine and Locomotive number 1. In 1981 the engine was restored and displayed in Stage 1 of the Powerhouse Museum project, located in the repurposed tram shed that became known as the Harwood Building. It was set up so it could be seen in motion, turned by an electric motor. In 1988 it was returned to steaming order and placed on display in the Powerhouse proper, in the exhibition 'The steam revolution' alongside one of the boilers that had produced steam for it in Goulburn. The cylinder was lined and a smaller piston was installed so that the original parts would not be subject to wear. The original piston was placed in store so that this refit could be reversed at a later date. This object is currently on display in The Steam Revolution at the Powerhouse Museum.